My first exposure to VMware came when I was starting as a System Admin for a financial services company. I invested a lot of personal time learning the technology, and was eventually given the task of re-architecting our virtual infrastructure. This was a formative time for learning and putting into practice VMware, networking and storage design skills before I dove into the consulting arena. I spent a couple of years consulting before I felt I had enough customer presentation and design experience to suitably defend a design. 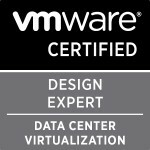 The design I submitted for my VCDX application was my first design at my second consulting job, and I remember thinking “Wow, this would be a great candidate for a VCDX defense.” It turns out that VMware and the panellists agreed. I began by completing my VCAP-DCD and VCAP-DCA at the end of October 2012. I submitted my initial design in early December of 2012 to defend at PEX. I didn’t pass, so I took a couple of months off to recharge. I went back at it for VMworld 2013, and passed. So about 10 months. Understand it’s not about the size or the complexity of the design you’re submitting to defend. It’s about your skills in designing around customer requirements and constraints, and mitigating risk to the customer and the project. Know your design, and recognize that if you include something in your design, justify it and know it. Finally, make sure your significant other knows and understands the journey you’re about to undertake. You’ll need their support, but it’s equally important to make time for them as well. I would engage my fellow applicants earlier – they will be much more critical of your design going through the process than someone outside of the VCDX program. I’d try to complete my design a couple of weeks ahead of the deadline and run through a mock defense. It will help you identify weak points in your presentation, both technically and grammatically. You can then improve your design for its final submission and review by the panel. Spend some time decompressing; you are going to need it! I had an overwhelming response from my co-workers, but the community response was what inspired me. Those who have been through the program realize the time and effort that goes into the entire process. To be counted among many of the very best names in datacenter and virtualization design is a humbling honour. Categories: Certifications, VCDX, Virtualisation, VMware | Tags: Certifications, design, VCDX, VCDX5, VMware | Permalink.